High Quality Winding Rewinding Machine for Offline Batch Coding of Mfg. Date, Expiry Date, Batch No., Sr.No and many more. It allows to apply on paper, film, and foil conversing industries and more with sophisticated process and hi-technology. Featuring with Torque control, tension controller, powder brake, printing System with Hot air ink drying and many more. 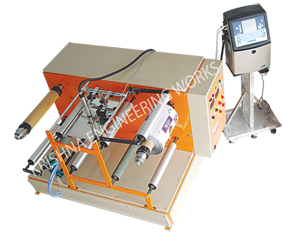 Different types of Winding Rewinding Machine Manufacturer for Offline Batch Printing. Also, 25 different types of Film Winding Rewinding For Batch Coding, Winding Rewinding For Batch Printing, Winding Rewinding With Inkjet Printer, Winding Rewinding With Thermal Transfer Overprinter, Winding Rewinding With Multihead Inkjet Printer, Doctoring Film Strip Winding Rewinding, Roll To Roll Batch Printing Machine, Roll To Roll Winding Rewinding For Batch Printing, per client’s requirement.